Mon - Fri 8:00 a.m. 4:00 p.m. The ZT2000 has a refined cutting system combined with the finely tuned twin-steering levers you get a precision cut every time. You’ll trim around trees and plantings with ease. You’ll mow straight, parallel lines in open areas quickly and superbly. Plus you’ll finish faster and enjoy it more. 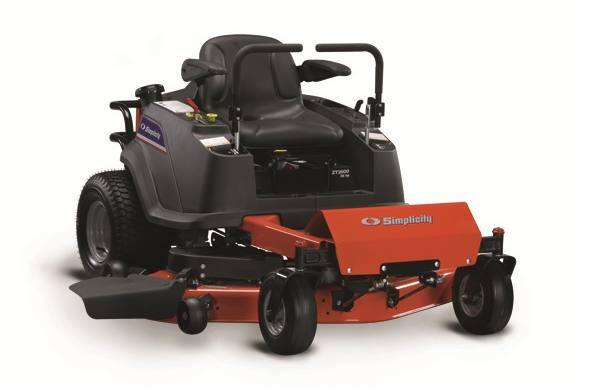 Powerful Engine: The ZT2000 offers a Briggs & Stratton Professional Series™ V-Twin engine designed to deliver world-class endurance and power. Professional-grade features deliver enhanced power, easy starting, smoother and quieter operation, long life, and professional results. Hydro-Gear® EZT® Transmission: The ZT2000 has Hydro-Gear's most popular transmission. Designed to meet the demands of heavier machines and greater horsepower. The EZT® delivers smooth, variable speed and bi-directional control in a compact lightweight package, for low maintenance mowing. Rugged Castor Wheels: Rugged caster wheel assembly and smooth tread tire prevents turf damage on hairpin turns. Each wheel swivel 360 degrees on ball bearings. Pivoting Front Axle: Cast-iron axle pivots with ground contours allowing the mower to ride smoothly over the lawn. Easy Access Controls: Provides you with fingertip control of throttle, mower engagement and electric height-of-cut. Twin-Lever Control: Soft-touch, twin-lever control lets you glide through turns and around obstacles controlling ground speed with spin-on-a-dime maneuverability. 52" Mulcher Kit: Our innovative system reduces clippings and returns them to your lawn. Shredder blades (sold separately) install to pulverize crispy fall leaves. Triple Catcher: Collect up to 10-bushels of clippings into three easy-to-empty bags. All Power levels are stated gross horsepower per SAE J1940 as rated by Briggs & Stratton. Shredder blades with mulcher kit must be ordered separately. Select collection systems for zero turn models are available with or without a turbo.